People get into genealogy, in part, because they fantasize about connections to famous people. The odd thing is that any mathematician can prove you are just that, connected to Big Names, by blood. The readings at the bottom of this page will give you all the material you need to explore this crazy idea, but first consider this: “The mathematics of our ancestry is exceedingly complex, because the number of our ancestors increases exponentially, not linearly. These numbers are manageable in the first few generations—two parents, four grandparents, eight great-grandparents, sixteen great-great-grandparents—but they quickly spiral out of control. Go back forty generations, or about a thousand years, and each of us theoretically has more than a trillion direct ancestors—a figure that far exceeds the total number of human beings who have ever lived” (Olson 2002). 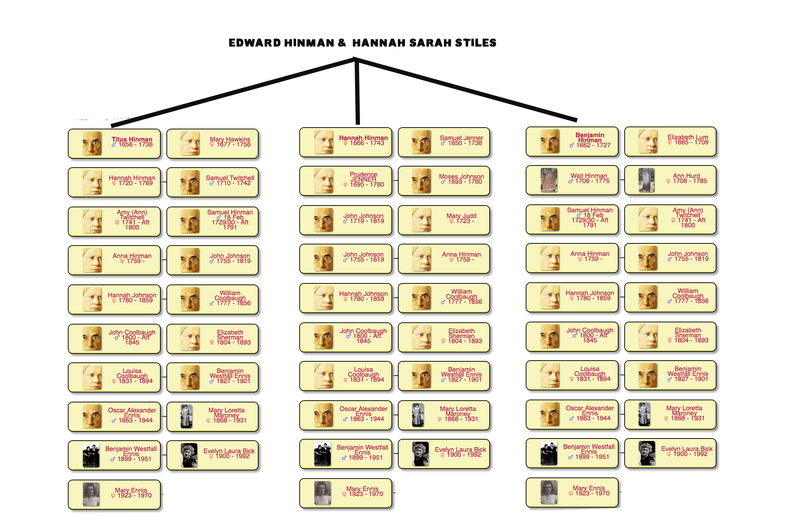 EEG is directly descended from the three of the Hinman’s six children in the chart below. That is, Titus Hinman, Benjamin Hinman and Hannah Hinman each grew up, went out into the world, found spouses, married and had children … and then within four generations, those three lines had collapsed into two and then into one. Specialists estimate that 80 percent of historical marriages were between second or closer cousins, so that one person occupies many different spots on a single family tree, and your tree starts shrinking once you’ve gone back so many generations. You have to study the chart below pretty closely before you can figure out where the three lines overlap and then collapse. Benjamin’s grandson Samuel and Titus’s granddaughter (Amy) had a daughter (Ann) who then married Hannah’s great-grandson John Johnson, and with their children the three lines were collapsed into one. Pedigree collapse is the term used by genealogists and in population genetics. Matsen, Frederick A. and Steven N. Evans. 2008. To what extent does genealogical ancestry imply genetic ancestry? Theoretical population biology, 74.2: 182-190. Ralph, Peter and Graham Coop. 2013. The Geography of Recent Genetic Ancestry across Europe. PLOS Biology. online Also: European Genealogy FAQ from the Coop Lab: Population and Evolutionary Genetics, University of California at Davis. 1. ↑ Edward Hinman arrived in Boston, Mass on June 1650, as crew aboard the ship William & George of London. The evidence for this statement is a part of the public record of Boston: the notorial records of William Apsinwall from 1644-1651 which were published in Boston, 1903. The William and George of London, a ship of 180 tons, which arrived in the harbor of Boston in June 1650, the crewman sued the Capt Barnaby Stanfast for wages, and began legal activities recorded by Aspinwall. Records for the Governor and Company for the Massachusetts Bay in New England (Boston: William White, 1853-1854, 5v,III:202.